Seksek (Hopscotch) kurallarının ingilizceleri. Seksek (Hopscotch) nasıl oynanır, ingilizce olarak anlatımı, hakkında bilgi. 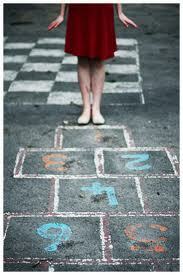 There are as many different hopscotch course layouts as there are playgrounds. But they all have some common features. Draw the course out on the floor with six, ten, or more spaces depending on the age of the players and how complex you want the game to be. To begin, the first player tosses their marker onto square one. They must hop over that square and land on squares two and three with one foot in each. 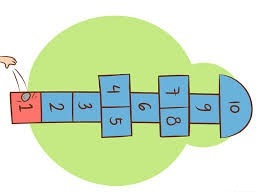 Next, they hop on one foot and land on square four, then jump and land on two feet in squares five and six and so on until they reach the end, square ten. There they must turn around by hopping on one foot and come back the same way they went up, stopping on squares two and three to pick up their marker from square one. Next, they hop to square one and out of the grid. If no mistakes were made, the same player continues by tossing their marker to square two and repeats the process, always avoiding contact with the square that contains the marker.